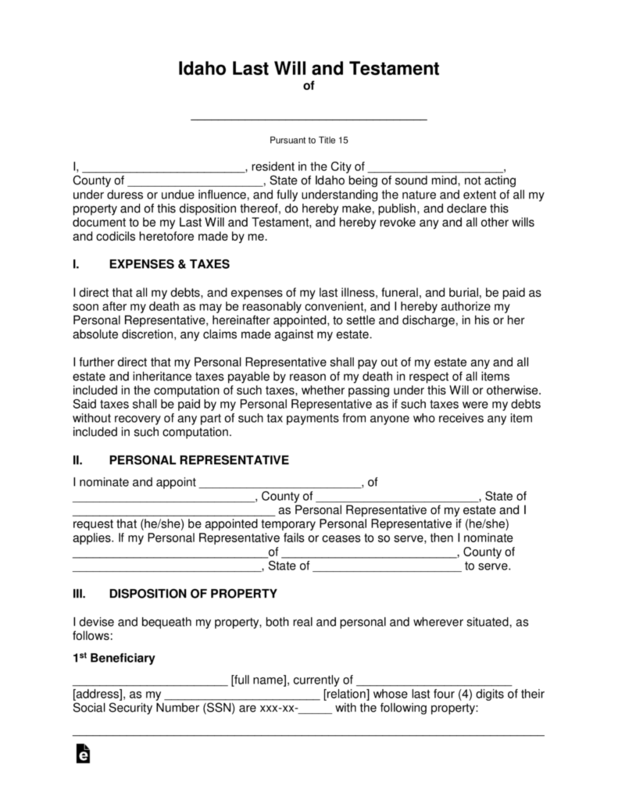 The Idaho Last Will and Testament is a legal document that is created by the testator (the person who wishes to have their property distributed upon their death), that ensures, in writing that their personal property, digital, real estate and any fiduciary assets will be properly distributed, according to their wishes to the testator’s chosen beneficiaries and will continue to protect their families and friends if they so desire, upon their death. 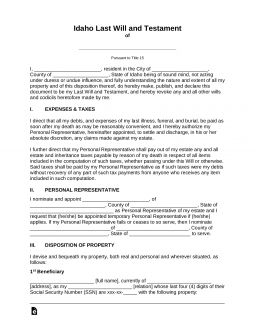 This document, once completed, must be signed by two witnesses and acknowledged by a notary public in the state. Register (§ 15-2-1001) – Must be filed with the Secretary of State by filing Form WR 1 and submitting to Secretary of State PO Box 83720 Boise, ID 83720-0080 along with the $10 filing fee. Signing (§ 15-2-502) – Signed by at least two (2) individual witnesses. Step 7 – Notarization – As the notary public witnesses all signatures, they must then complete the remainder of the document and acknowledge the document by affixing their state seal.